The TechRadar garden is a mess, so we're spending the next couple of days weeding, planting and watering. We've got some lovely shrubs to bed down, and a water feature to plumb in. But seeing as you're sat inside, why not take a browse through some of the reviews we've published this week? There's a lot to like about the Asus FonePad. It's clearest competitor is the similarly-priced, similarly-specced and similarly-crafted Google Nexus 7. There are a few tweaks and a slight change of materials for the chassis, but the big difference is the addition of 3G telephone capability. As a smartphone, its use is negligible. But as a tablet, the Asus FonePad shines just as brightly as it's Google-branded cousin. 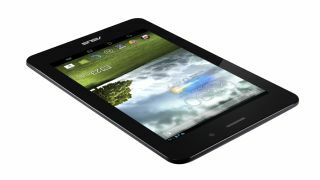 Asus has priced the FonePad very nicely - it's cheaper than both the 3G Nexus 7 and the iPad mini, which many see as the two ruling devices of the 7-inch market. Without doubt the BlackBerry Q10 is the best QWERTY keyboard smartphone on the market. However start stacking the Q10 up against handsets which have a similar price tag and you can't help but think it's possibly one of the most expensive keyboards on the planet, with little in the way of stand out features to justify its cost. If you can't live without a physical keyboard on your phone then you're more than likely going to buy this phone anyway - and that's fair enough - but if those buttons are less of an issue you'll get much more for your money elsewhere. The Sony NEX-3N is not a camera for advanced photographers looking for something to replace or sit alongside their DSLRs. Luckily, Sony already has cameras that meet that brief in its lineup. Instead, what we have here is something that anybody can pick up and be assured of great image quality. It's a shame that there are a few small bugbears along the way with operability - most notably in the frustration encountered when needing to switch off raw format shooting to use so many of the different functions - but overall this is a very competent compact system camera. Unlimited listening and offline syncing means you can put as many songs as you lie onto your devices. But is Napster as good as Spotify?